We report the results of a systematic study of the interplay of triplet-polaron quenching (TPQ) and triplet-triplet annihilation (TTA) on the efficiency roll-off of organic light-emitting diodes(OLEDs) with increasingcurrent density. First, we focus on OLEDs based on the green phosphorescent emitter tris[2-phenylpyridine]iridium(III) (Ir(ppy)3) and the red phosphorescent dye platinum octaethylporphyrin. It is found that the experimental data can be reproduced using kinetic Monte Carlo (kMC) simulations within which TPQ and TTA are due to a nearest-neighbor (NN) interaction, or due to a more long-range Förster-type process. Furthermore, we find a subtle interplay between TPQ and TTA: decreasing the contribution of one process can increase the contribution of the other process, so that the roll-off is not significantly reduced. Furthermore, we find that just analyzing the shape of the roll-off is insufficient for determining the relative role of TPQ and TTA. 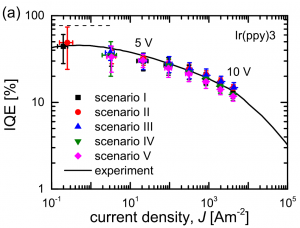 Subsequently, we investigate the wider validity of this picture using kMC simulations for idealized but realistic symmetric OLEDs, with an emissive layer containing a small concentration of phosphorescent dye molecules in a matrix material. Whereas for NN-interactions the roll-off can be reduced when the dye molecules act as shallow hole and electron traps, we find that such an approach becomes counterproductive for long-range TTA and TPQ. Developing well-founded OLED design rules will thus require that more quantitative information is available on the rate and detailed mechanism of the TPQ and TTA processes.